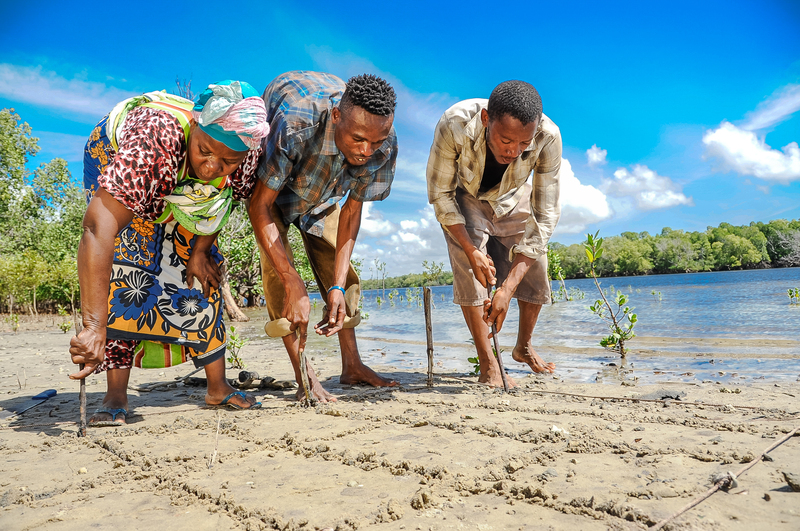 Since its inception in 2014, Mikoko Pamoja Community Based Organisation has been able to ensure conservation of 117 ha of mangroves in the Gazi bay. 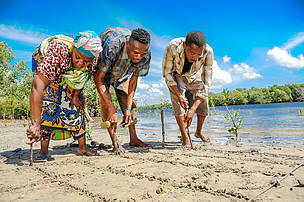 In addition, the group through the technical support from Kenya Marine and Fisheries Research Institute (KMFRI) and WWF-Kenya has established new mangrove forests covering 10 ha. In return, the community has received a total of USD 25,000 over the past two years, proceeds whose impact has breathed life into the two villages and put it back on a growth trajectory rekindling hopes of a better tomorrow for future generations. Mangroves store 50 times more carbon in their soils by surface area compared to tropical forests, and ten times more than temperate forests. This phenomenon makes the conservation of the coastal trees a must win in a bid to combat global warming and climate change. The science of carbon sequestration flies over the heads of many, but for a community in two remote villages of Gazi and Makongeni in Kwale County in Kenya’s South Coast, ‘kaa hewa’ as carbon credit is usually referred to in their local Swahili dialect is slowly and steadily transforming their livelihoods. Residents of Gazi in Kwale County are your typical fishers community, living a subsistence lifestyle with limited agricultural activities to sustain them. Their poverty level is presumably very high as well according to the National Population Census of 2009 by the Kenya Bureau of statistics given the low education levels. For ages, wanton extraction of mangrove trees impacted negatively not only on their livelihoods but also the environment in Gazi Bay. The area remains the main target for illegal loggers of the mangrove trees because the poles in this specific area are suitable for construction for they are straight and more usable. They are also widely extracted for wood fuel. For a community whose utilization of the mangroves is a tradecraft handed down through several generations, their wake up call came when their livelihood was threatened due to wanton destruction of the mangroves. It started off with marked reduction of fish caught. This was directly attributed to the excessive illegal logging, since mangrove forests are home to a large variety of fish, crab, shrimp, and mollusk species. The forests also serve as breeding grounds for many fish species, including coral reef fish. Absence of the dense mangrove root systems that trap sediments flowing down rivers and off the land that helped stabilize the coastline and prevents erosion from waves and storms was another direct threat to their lives. And much as many thought the aesthetic value of the mangrove forests was never a concern, the steady loss of the thick greenery reminded the community that in a bid to survive, action had to be taken. The key that unlocked the intervention that sought to resuscitate the livelihood of the Gazi Bay Community and reverse the depletion of the mangroves, was the realization by the villagers that the mangrove forest do not belong to the government. This important realization initiated the need for community involvement in conservation of mangrove and in return they get paid as a direct benefit from conservation. The key interventions included; Sensitization of the community members on how cutting down of mangrove trees destroys fish nests and other marine life that in turn affects their livelihoods. Introduction of fast growing casuarina tree plantations as an alternative source of wood fuel and construction posts as well as the formation of the Community Forest Association (CFA) through which the community protected and established new mangrove forests for Carbon trade with the technical assistance from KMFRI and WWF-Kenya was one of the other key interventions. They are now reaping benefits through the annual income they earn that come directly to them. The interventions have since brought tangible outcomes that according to Mama Hafsa, has put the communities of Gazi and Makongeni village on an unprecedented growth path. 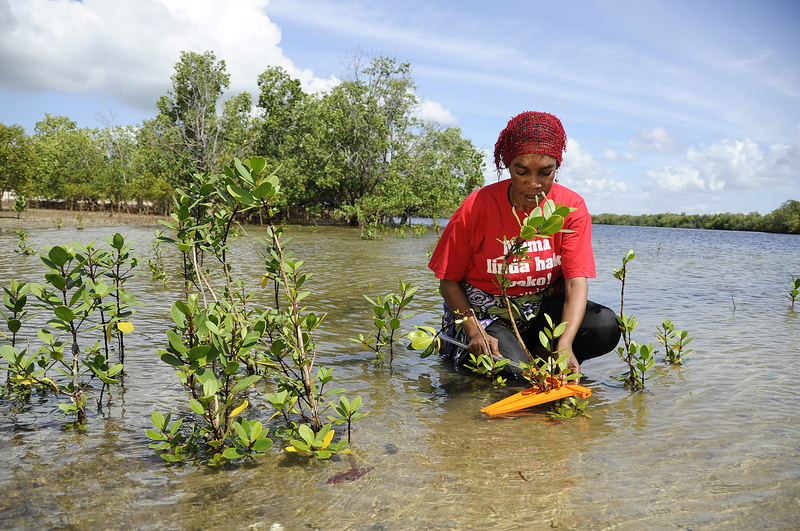 In addition, through the deliberate steps spearheaded by the community to conserve mangroves, Mama Hafsa says, ‘’ As a community, we are now so well educated about mangroves. After the first year, we received a total of USD 12,530 we used our share to install water in the entire village. while the second earning connected at USD 5 to every home with a monthly fee of USD 2.5 every month. Community members preparing to plant seedlings. 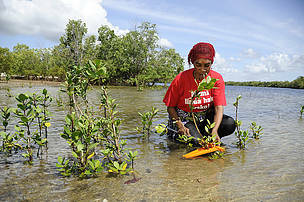 Mama Hafsa monitoring the growth of mangrove.